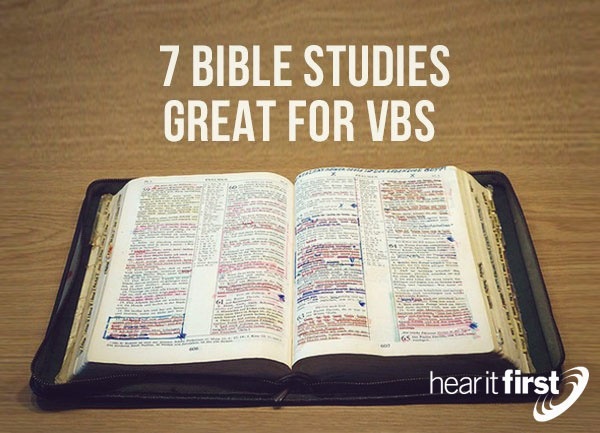 Here are seven great Bible studies you can use for Vacation Bible School. Remind the young people that Jesus died for us who are saved while we we're still His enemy (Rom 5:10). Jesus prayed, "Forgive them Father, for they know not what they do" (Luke 23:34) and this was for those who had just nailed Him there! Imagine Jesus, being in such excruciating pain and having been tortured and crucified by the Romans who had beaten Him and crucified Him, the Jews who had illegally tried Him, those who forsook Him, those who betrayed Him, and Pilate who declared him to be guiltless yet sentenced Him to death anyway. Since Jesus died for the ungodly, wicked sinners who were His enemies, should we not treat those who might be our enemies with the same kind of unconditional love that Jesus showed us? It is only by God's grace that we are in the kingdom (Eph 2:8-9), so instead of trying to get back at your enemy, fight hate with love, persecution with prayer, indifference with compassion, and bad deeds with good. Jesus commands every one of us to "Love your enemies and pray for those who persecute you" (Matt 5:44). The Apostle Paul refers to this theme in Philippians 2:3 in writing "Do nothing from selfish ambition or conceit, but in humility count others more significant than yourselves." Teach them that "submitting to one another out of reverence for Christ" (Eph 5:21) is not just for adults. Children should treat one another with respect and dignity because everyone is made in the image of God (Gen 1:27) and when we treat others wrongly, God see it as doing it against Him. We see the same thing when Saul, who was later named Paul, was asked by Jesus on the Damascus Road, "Saul, Saul, why are you persecuting me" (Acts 9:4). When Paul asked, "Who are you, Lord?" And he said, "I am Jesus, whom you are persecuting" (Acts 9:5) so when we are bad to people in the church, children need to know, we're doing it to Jesus, because He is the Head of the Church and what's done to the body (the church) is felt to Him; what's done to the believer is done to Him; either for good or bad (Matt 25:40). I have been thrown, headfirst, into many a church fracas and tried to be a peacemaker. For one thing, I tried to take the focus off the two people and fix their attention on the problem. It's very easy to blame the problem on the person you're arguing with, but that gets us nowhere! Peacemakers know that "A soft answer turns away wrath, but a harsh word stirs up anger" (Prov 15:1). Peacemakers seem to understand that "A hot-tempered man stirs up strife, but he who is slow to anger quiets contention" (Prov 15:15). That's what peacemakers do! They try to and sometimes do make peace, acting as an arbitrary or mediator to reach common ground. Solomon tells us, and specifically, the peacemakers, "a soft tongue will break a bone" (Prov 25:15b), meaning that a soft voice and calm demeanor can help settle even the most formidable of conflicts. They can practice this at VBS or at school, at the park, or anywhere they see their friends get into an argument. This is not recommended for those they don't know, like a stranger, which may result in both parties coming after them! Jesus says of those who try to make peace between people, "Blessed are the peacemakers, for they shall be called sons of God" (Matt 5:9). Remind them that Jesus made peace between us and God (rom 5:1) and ended our separation from Him that our sins had caused (Isaiah 59:2). This was a very unstable time for Israel because "The people of Israel did what was evil in the sight of the Lord", so "the Lord gave them into the hand of Midian seven years (Judges 6:1). The nation suffered because they had been disobedient in keeping God's commands and God will not ever bless disobedience. For this reason, "the Midianites who "would come up with their livestock and their tents; they would come like locusts in number-both they and their camels could not be counted-so that they laid waste the land as they came in. And Israel was brought very low because of Midian. And the people of Israel cried out for help to the Lord" (Judge 6:5-6). To show children, and adults, that our victory is not a result of the human will or might but of God alone Who brought Gideon's army of 300 against the Midianites, skilled and experienced men of war that numbered into the thousands, but when God is for you, no one or nothing can ever be against you (Rom 8:31). The lesson is that despite what the odds look like and even if the situation looks impossible, nothing's impossible with God (Matt 19:26) Who is for you and with you. The account of David and Goliath is one of courage, yes, but it's more than that. David's courage was because He knew God well enough to know that nothing is too hard for Him. When David took on Goliath, he said, "We know that Goliath had brothers who were equally gigantic (2nd Sam 21:19; 1st Chro 20:5) so David may have had 5 stones in the event that his brothers appeared.or in case others went after him. We're just not told why David had 5 stones..we know at least one was for Goliath. Did he believe he would have missed and so brought spares? No, because David's confidence wasn't in himself, it was in God as he said, "You come to me with a sword and with a spear and with a javelin, but I come to you in the name of the Lord of hosts, the God of the armies of Israel, whom you have defied" (1st Sam 17:45). God plus one is always a majority. Jesus walked on water on at least two occasions that we know of (John 6:16-21; Mark 6:45-51) but on one occasion, even one of His disciples did. That was the Apostle Peter, and always being the bolder one, He asked Jesus "Lord, if it is you, command me to come to you on the water" (Matt 14:28) and "So Peter got out of the boat and walked on the water and came to Jesus. But when he saw the wind, he was afraid, and beginning to sink he cried out, "Lord, save me." Jesus immediately reached out his hand and took hold of him, saying to him, "O you of little faith, why did you doubt" (Matt 14:29-31)? After this, they were awestruck and worshiped Him and when He once calmed the storm, they asked, "Who is this? Even the wind and the waves obey him" (Mark 4:41)! The conclusion is we must keep our eyes on Jesus or we'll sink, just as Peter started to (Matt 14:30) and believe that Jesus is Lord of all, even of the storms in our lives. Jesus was once led into the wilderness by the Spirit of God and fasted for forty days and nights and it was while Jesus was there that Satan came to tempt Jesus. Make sure to tell the children that the word tempt is Greek (peirazo) "trying whether a thing can be done" and in Satan's case, he had no chance at all because God cannot sin and since Jesus is God, Jesus could not sin. It is so contrary to His nature that it would be impossible, just like it is impossible for God to lie (Heb 6:18). That is an unchangeable attribute of God. Satan can't get Jesus to change because God does not change (Mal 3:6) and that's great news because God never goes back on His promises and not one word ever failed from Scripture. Each time children are tempted, remember what Jesus did; He quoted Scripture that opposed what Satan was trying to do (lawbreaker that he is). Tell the VBS students that God's love never fails and He will never leave them or forsake them (Heb 13:5). Of that truth, they can rest, no matter what their life is like. When teaching children about God, recall some of the epic events from the Bible in both the Old Testament and the New Testament and don't say, "These are stories" but say, "These are actual accounts of what God did, and the greatest thing of all was to be born into flesh and to live a sinless life, to be our Redeemer, on behalf of God to reconcile us back to Himself or actually, to Himself for the very first time. For everyone, young or old, that God has brought to repentance and trust in Christ, they are now the children of God and every bit a child of God as their parents are (hopefully).